If there is one episode of Anthony Bourdain’s “No Reservations” that sticks with me, it is his trip to Venice. In that episode he has risotto di go, an ethereal dish that hinges on a magical fish broth, made from gobies. Called “go” in Venetian dialect, a goby is a tiny little fish that’s no good for anything but making broth. Any true, authentic risotto di go must have the goby from the Venetian lagoons. Alas, this is impossible outside Venice. 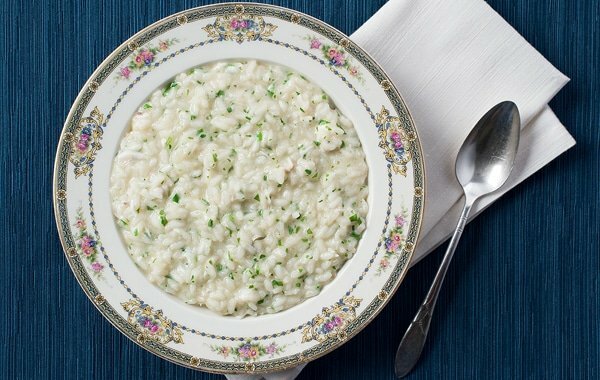 But the technique of making this risotto is repeatable — and unforgettable. No matter what fish you make it with, a Venetian fish risotto is always a little soupy, always hinges on a rich, pampered broth, and is almost always as white as a virgin mind. It is one of the most beautiful things you can create from such humble beginnings. Done perfectly, a bowl of this risotto will restore your faith in humankind and make you misty with thoughts of a simpler age, a quieter time. It all begins with the broth. You cannot make a great fish risotto with anything other than fish broth made immediately prior to making the risotto. Yes, you can make passable ones with broth from a few days ago, thawed broth or even a little clam juice. But it will not be the same. Not by a longshot. Clean, golden fish broth is why risotto di go or any other good fish risotto is such a beloved dish. Heads, backbones, fins all go into the pot; only the guts and gills, which are bitter, are tossed away for the seagulls. Look at the eyes on these striped bass: So pretty, so crystalline. To throw them away would be a sin. In fact, the first thing I made after I caught these fish was broth for risotto — the fillets could wait. This is not a difficult recipe to make. And you can make it no matter where you live, as most any white, lean fish will work. What’s more, the fish broth you need for it comes together in less than an hour. It’s the method for making the risotto that takes time to perfect. But this is one of a very few fish cooking techniques that everyone should master. After all, who wouldn’t want to make magic from little more than rice and a bucket of bones? I used striped bass for the broth in this recipe, but you can use any lean white fish. I've done this with yellow perch from Lake Erie and it was sublime, and codfish, walleye, smallmouth bass, black seabass, Pacific rock cod and ling all work fine. The fennel is important, so if you can't find a fennel bulb, add a tablespoon of fennel seeds to the broth. It's also vital that you use short-grained rice, preferably proper risotto rice -- long-grained rice lacks the particular starch needed to make a risotto. Bring a pot of water to a boil and drop in all the fish heads and bones. Let this return to a boil and cook for 5 minutes. Turn off the heat and discard the water. 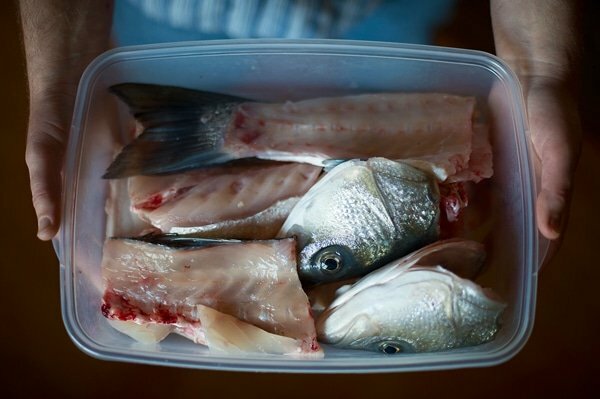 Pick off about 1 cup of fish from the carcasses and heads and set aside in the fridge. Clean the pot or use another, and heat the olive oil over medium-high heat. Saute the celery, onion and fennel bulb for 3 to 5 minutes, stirring often. Do not let it brown. Add the minced garlic and cook another minute. Add the blanched fish carcasses, green peppercorns, bay leaves and parsley and cover with enough water to submerge everything by 1 inch. Bring to a bare simmer, then drop the heat a little until the broth is just steaming, about 160°F. Add salt to taste. Let this cook gently like this for 45 minutes to 1 hour. Once the broth has been cooking for 45 minutes, start the risotto. Heat the olive oil in a medium pot over medium-high heat. Saute the shallots for about 90 seconds, until they turn translucent. Add the garlic and cook another minute. Add the risotto rice and stir to combine. Cook, stirring often, for 3 to 4 minutes. While the rice is cooking, get a fine-meshed sieve and a ladle ready. Add the white wine to the risotto and stir to combine. The rice will almost immediately absorb it. When the pot is nearly dry, add two ladles of the fish broth -- poured through the strainer to make sure all that's in the risotto is broth, not debris. Stir the risotto almost constantly until the rice absorbs the broth. Taste for salt and add a little if needed. Repeat this process of adding a ladle or two of strained broth and stirring until it has absorbed until the rice is fully cooked, but still al dente. You want it just past the point where there is a little chalkiness at the center of each grain of rice. This normally takes 35 minutes or so. When the rice is ready, stir in the remaining ingredients. The risotto will tighten up, so add a final ladle of fish broth right before you serve. 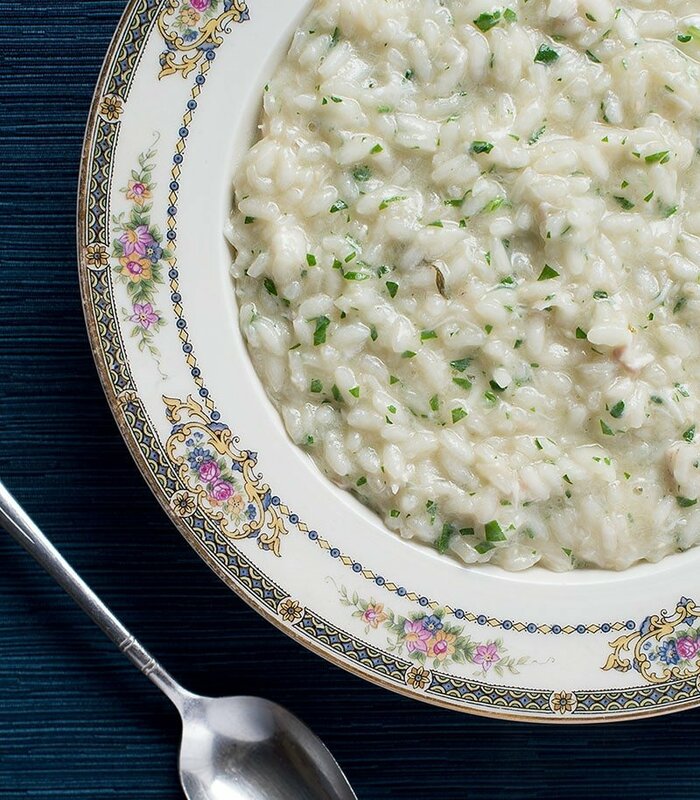 This risotto needs to be a little soupy; the Italian term is all'onda, or "under the waves." You may end up with more broth than you need. That's OK, once it's strained it will keep for a week in the fridge and will freeze well for up to 3 months. Daisy: That’s on purpose. It all depends on your pot. You typically cover the ingredients by about 2 inches of water.